I go by Betty to friends and family, but my full name is Elizabeth Rose (Safran) Malyon. I grew up in a creative family with two artist parents and was submersed in art from the very start of my life. I did not become a professional artist – instead I chose a different path – I studied Art History and Classical Studies and Archaeology, and got a graduate degree in Museum Studies. I worked in the museum field until my father, Bernard Safran, died in 1995 and I then became the custodian of his Estate Collection. The Collection includes hundreds of works of art, his notebooks, his sketchbooks, all his photography and many personal items like his easel and palette. 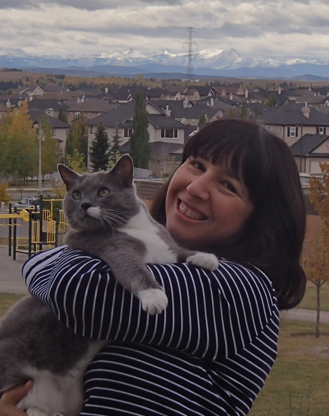 I live in Calgary, Alberta, Canada with my husband John (the creator and director of Artcyclopedia.com) and my three cats. We have two wonderful daughters; Serena is a professional artist and Rachel is studying wildlife biology. Hola, My name is Carlos Pinto, I’m researching the work of YENOVK DERHAGOPIAN, an Armenian artist who die in 1966 and him Brother wrote a few novels, one of it was illustrated by your Father here is the link… http://babel.hathitrust.org/cgi/pt?id=mdp.39076002945710;view=1up;seq=1 I’m a professional Artist living in Brooklyn, I will love to know if you have some records of the work he did for Der hagopian or if they where friends. Hola Carlos – As I said in my email to you I am looking into the cover art that you linked to. I just wanted to say that I visited your web site and think your work is great – really original and dynamic – I love it. Thank you for contacting me – I will be in touch soon. I live on Gard Avenue in Armour Villa, the section of Bronxville where you grew up. I am editor of our little neighborhood newsletter, The Villa Voice, and would love to send you a copy. I recently wrote about Feodor Rojankovsky’s years here and have gotten to know his daughter, Tanya, through email. She is the person who turned me on to your blog. Several of my older neighbors used to pose for your father when he did those Time magazine covers, and I am friends with Monna MacLellan, from whom you got Babby. She’s in her mid-80s now. Since I am very interested in history and art, particularly in Armour Villa, I would love to chat with you more about growing up here. Tanya says your father took lots of photos, so I am hoping he took several snapshots of this neighborhood back when, and that you might share them with us. If you would send me your email address, I would love to correspond with you about your formative years in this neighborhood. I read your photography post and would like to connect. My wife and I run the Pacita Abad Art Estate (pacitaabad.com), which handles the artwork of my late wife. Please send me your email so we can connect on Linked In. My apologies for not responding to your recent post sooner. Its very nice of you to reach out to me. I’ve visited your website for your late wife Pacita Abad and her work is extraordinary. I am also very impressed with the level and quality of work that you are able to manage through the estate. I am a one person team here, and so I am slow to accomplish much – though I continue to plod on. I hope to work on my data base to complete a catalogue raisonne this winter… my biggest expense and delay is having all the work digitally imaged at hi res. If you’d like to correspond I’m very happy to – sometimes I do feel very alone out here on my own. Thanks for the link – Pulp covers have become such a big business for collectors lately, that its not surprising that people are starting to take a more in depth look at them. Hi Betty, I’m your cousin Ilene from White Plains. It’s been forever. Hope you remember me! I wanted to be in touch via email, but don’t have an email address for you. Also, I’ve been looking at this blog (just signed up for it) and so fondly and clearly remember your home in Bronxville, where we used to go when we were kids. The photos are wonderful. I’m Barbara’s age, and I clearly remember playing with you both in your home and in the little yard, and visiting the studio. I also remember your living room with the fireplace (I was so jealous!) and especially remember the braided rugs that your mother loved on the bare wood floors by the front door. I had never seen colonial-style braided rugs before, and was totally fascinated with the way they were made, curving around and around from the center. Every time, to this day, that I see a coiled rug, I think of your family. Do be in touch if you have a chance. All my best! I have a painting by your mother. I would love to email a few photos to you. I am not a social media user and was stumbling around researching your mother’s work when I found this site. Let me know if you would enjoy seeing a few photos of the painting. I recently came across your blog when researching the Halifax Explosion. As this is the 100th anniversary, I’m in Halifax now doing some digging about our relatives, the Francis family, who lived through the explosion. Your post of “Bainie’s” letter was most helpfu! My grandfather was Edward Ansell Francis, older brother to Mary Elsie Francis, who we knew as Aunt Elsie. Edward and my grandmother Olive lived is Saugus, MA, and Elsie would occasionally visit. A genealogy compiled by Edna Francis Levitt about the “Way Family” gives a lot of detail about the Francis Family from William and Catherine up to the 1960’s, including Elsie and Colin’s family! There is also mention of an original valentine written by William Francis (Tayor) to Catherine (Kate) Way and an original poem in his handwriting from around 1853 is still in existence and was “in the possession of Elsie Innes’s daughter”. Would you have any information about this? It would be great to have a copy of these if they still exist! I hope you get a chance to respond to this at your convenience. We Francises are pretty spread out and haven’t done well at connecting with each other. My wife, Heather, and I live in Scarborough, ME. My email address is rhfrancis52@gmail.com if you’d like to email me. There is a oil painting seascape with boats by Adele Innis at one of our local charity shops…could this be your mother? Hello: If you could send me a picture of the painting I’d be able to tell you if it’s by my mother, Adele (Innes) Safran. It may be from her student years at Pratt Institute or earlier. I’d love to see it. The piece is mid-century I am sure by the style & frame. I will take a picture of it fri. if it is still there . I poked you because I did not know if you owned many paintings by your mother. It has a printed signature if that helps. I’m very curious to see it – so thank you for your efforts!